Joan Crawford - "Monica Rivers"
Ty Hardin - "Frank Hawkins"
Michael Gough - "Albert Dorando"
Judy Geeson - "Angela Rivers"
Robert Hardy - "Detective Superintendent Brooks"
Following the public freak-accident death of a high-wire performer, circus-owner Monica Rivers (Crawford) become the center of the attention as murders begin to plague the traveling circus. ​ "Berserk" was the first film made under a three-film contract with Columbia Pictures in February 1966. October 10th: Filming begins in London, England​. October 20th: Joan and the cast and crew attend Billy Smart's Circus' "Gala Night"​​. On this date much of the circus footage used in the film is record. July 27, 1967: Special screening at the Walnut Mall Theater in Petersburg, Virginia. ​December 19, 1967: Special screening at the Lowe's Theater in Dayton, Ohio. January 11th, 1968: Limited release in 28 theaters in New York. January 27th, 1968: The film opened in six theaters in Toronto, Canada. April 14th, 1968: Opens at the Fox Theatre in Detroit, Michigan.​​ The premiere is attended by the film's producer, Herman Cohen. ​​​​ $310,138.00 (Opening week, January 10-15, 1968) ​29 New York theaters: (Including; DeMille, Loew's 83rd Street, Orpheum, Sheridan (Manhattan) Paradise (Bronx), Paramount, Stapleton (Staten Is. ), Avalon, Kings, Met, Oriental (Brooklyn), Bay Terrace, Elmwood, Prospect, Triboro, Valencia (Queens). $18,000.00 (First week, January 11th, 1968) The Demille Theater - New York, New York. ​​ $18,000.00 (First Week, January 27th, 1968) 6 theaters - Toronto, Canada. $16,200.00 (2-day, February 9th-10th, 1968) 2 theaters - Columbus, Ohio (Loew's, Loew's East)​​. $120,000.00 (​​Week of February 14th, 1968) 27 theaters - National. $7,000.00 (2-day, February 16th-17th, 1968) Beacon Theater - Boston​, Massachusetts. $26,000.00 (Second week, February 28th, 1968) Philadelphia​​, Pennsylvania. $11,000.00 (Third week, March 20th, 1968) RKO Theatre - ​​New York, New York. $11,382.00 (1-day, Opening week, April 14th, ​​1968) Fox Theater - Detroit, Michigan. 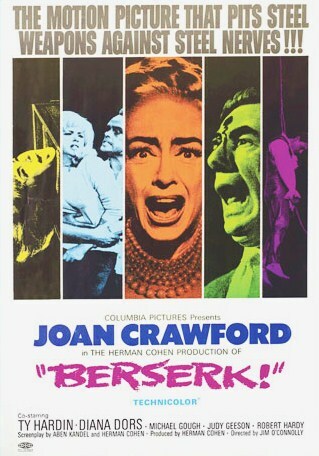 ​"Joan Crawford, one of motion pictures' great stars, returns to the films in "Berserk," now showing in New York. "Berserk," the new suspense drama starring Joan Crawford, had its metropolitan New York area premiere at the DeMille Theater on Broadway and at 28 Showcase theaters on January 10. Co-starred in the mystery-thriller are Ty Hardin and Diana Dors. Featured are Michael Gough, Judy Geeson and Robert Hardy. ​​Miss Crawford, one of the screen's greatest stars, plays the owner and ringmaster of a traveling circus that is plagued by a series of grisly murders. ​In recent years Miss Crawford has made a number of highly successful films, among them "Sudden Fear," "Whatever Happened To Baby Jane?" and "Strait-Jacket." ​Teenager Judy Geeson is one of the screen's most popular newcomers. In the past year she has made four films, "To Sir, With Love," with Sidney Poitier, "Hammerhead," with Vince Edwards, "Prudence and the Pill" with Deborah Kerr and David Niven, and "Berserk." ​The Herman Cohen production for Columbia Pictures was filmed in England under the direction of Jim O'Connolly from a screenplay by Cohen and Aben Kandel.​​​​​"